This beer literally will open your door. In the sports apparel business, Under Armour had used the tag line “Protect This House.” Building on the theme, Heineken has created a device that ensures guests coming over to your house enter with the correct beer. Below is the Door lock, a connected lock that opens when reading a particular beer label. This clever idea is shown to help reinforce the partnership/sponsorship between Heineken and UEFA Champions League. In addition the door lock should help promote the social side of beer. 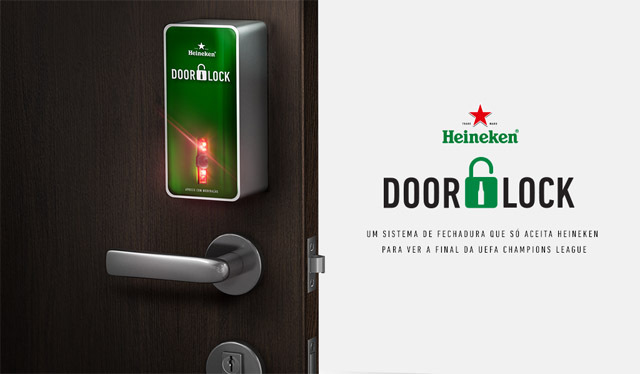 The end goal of all marketing & advertising would be to sell more and this Heineken Door lock has a small chance to accomplish that. The largest upside is its worth in social media sharing, brand reinforcement and overall buzz for Heineken. Now a days, if the content is not shared via social media channels it’s like it never happened. This entry was posted in Activation, Beer, Branding, Imports and tagged Heineken, Soccer, UEFA Champions League. Bookmark the permalink.